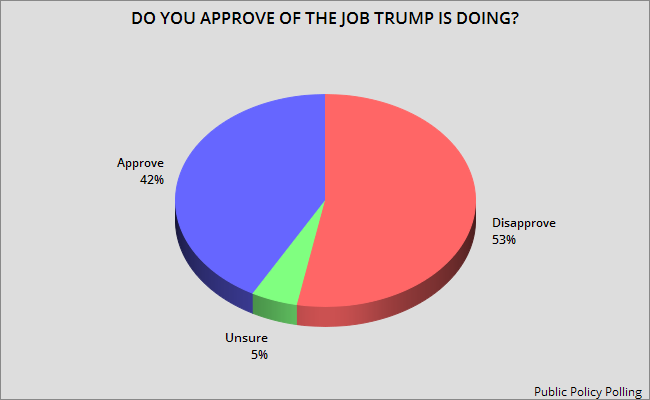 These charts reflect the results of a new Public Policy Polling survey -- done between September 22nd and 25th of a random national sample of 865 registered voters, with a 3.3 point margin of error. It paints a very poor picture of Trump's presidency. 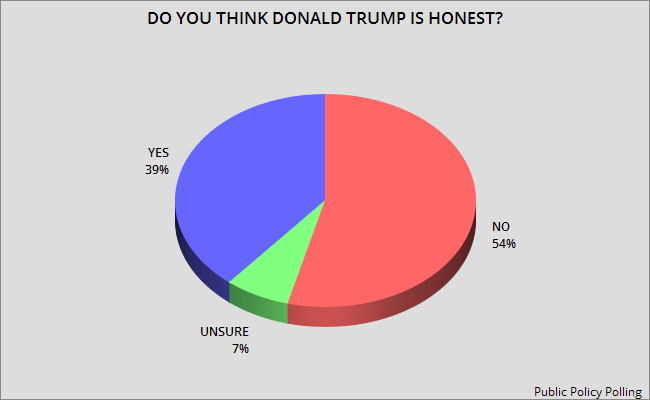 Majorities disapprove of the job he is doing (53%) and believe he is dishonest (54%). 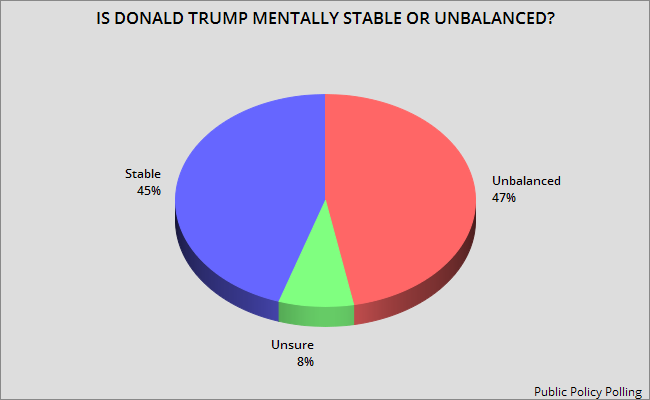 And pluralities think he is mentally unbalanced (47%), would like to see him impeached (48%), and think he is more corrupt than Richard Nixon (41%). When Hurricane Katrina hit New Orleans, President Bush praised his FEMA head, Michael Brown, telling him "Heck of a job, Brownie" -- when the response was clearly inadequate, and he was not doing a good job of responding to that disaster. Bush later realized his mistake, and sent General Honore to New Orleans with 20,000 military troops -- and Honore was finally able to get done what needed to be done. 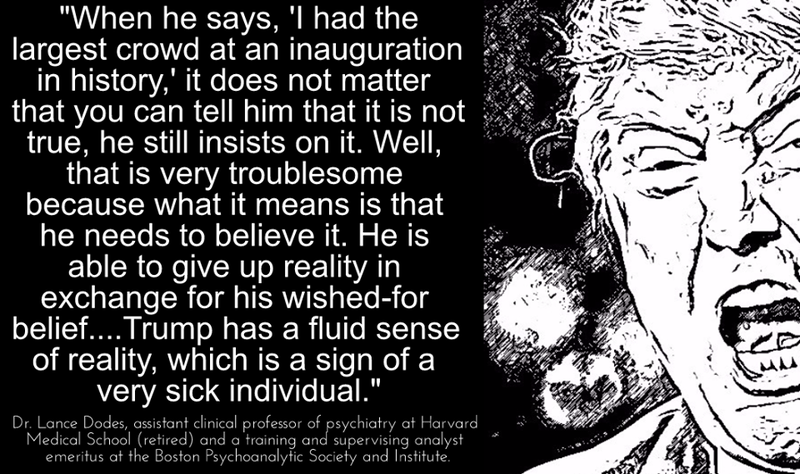 Donald Trump is repeating the same mistake. 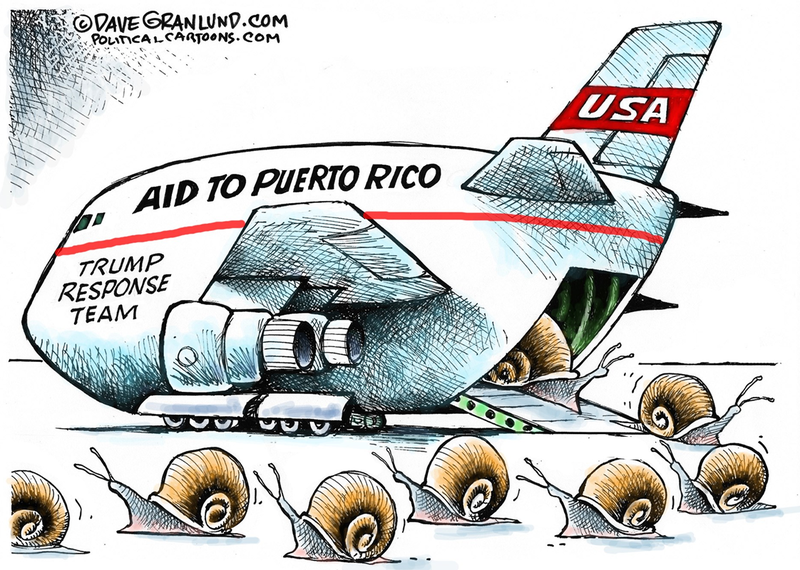 While he is bragging about what a good job he is doing for Puerto Rico, the truth is that he has not responded adequately to the disaster there. The situation is dire in San Juan, and even worse in smaller cities across the island. 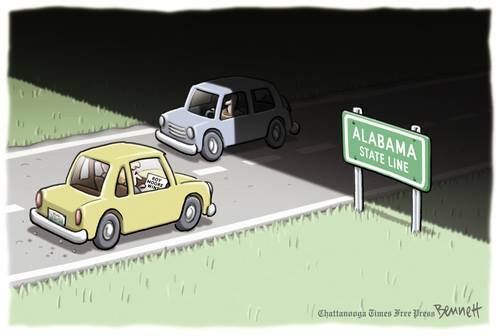 Lives are in danger as people must do without power, food, water, medical supplies, etc. There are only about 2,500 troops to handle the disaster, with another 2,500 on the way. That is not enough! If it took 20,000 in New Orleans, it will take at least that number to get a handle on the disaster in Puerto Rico. Why haven't they been sent? Supplies are pouring in, but can't be sent to where they are needed because of a lack of truck drivers and roads that have been destroyed. Why are troops manning this trucks and delivering supplies? Why aren't military helicopters dropping supplies in towns that can't be reached by truck? Trump's response is clearly inadequate, and instead of fixing the problem, he is blaming the media for telling the truth. With all the sarcasm I can muster, I say "Heck of a job, Trump". I found these charts interesting. They are from a fairly recent Pew Research Center Poll -- done between March 2nd and April 10th of a sample of 1,000 Mexican citizens, with a 4.4 point margin of error. 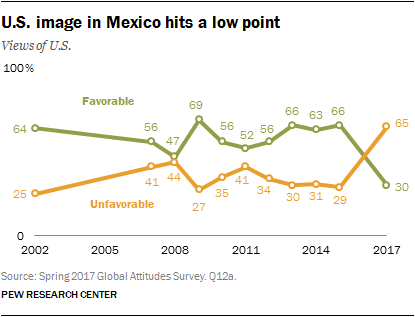 During the presidency of Barack Obama, about 66% of the Mexican people had a favorable opinion of the United States. 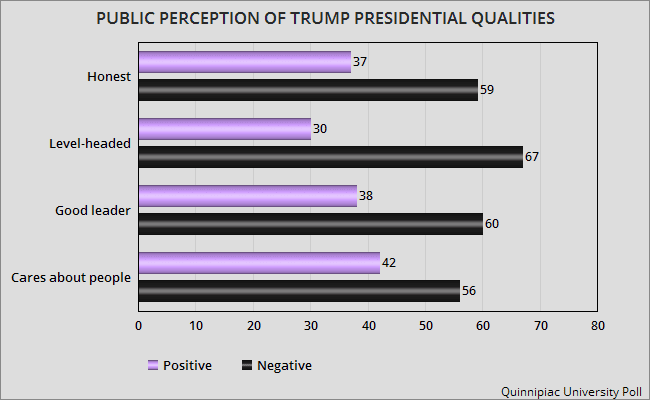 Under Donald Trump, that favorable opinion has fallen to 30% -- a drop of 36 points. 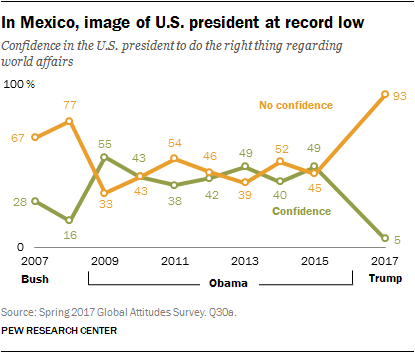 Also, the confidence that the U.S. presidents would do the right thing regarding world affairs has dropped from 49% to only 5% -- a fall of 44 points. Donald Trump has seriously damaged the relationship between the people of Mexico and the people of the United States. 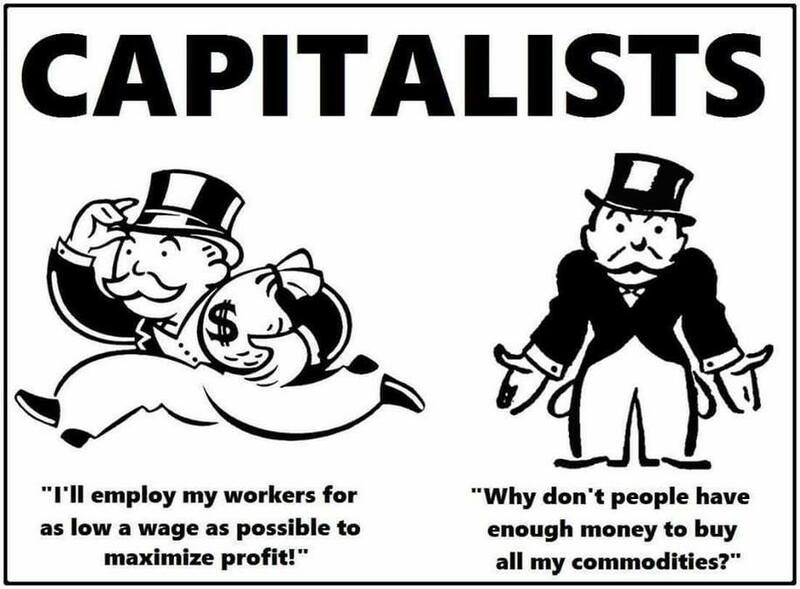 What If The Rich Paid Their Share ? This chart was made using information from the June 2017 UNICEF report on food insecurity among children. While they gave information on every country (and you can access that here), I just listed in the chart the 30 most developed nations. It shows the percentage of children under the age of 15 that lives in a food insecure household (a household in which there is not always enough food or money to buy food). Being the richest nation in the world, and claiming to be a moral and equal nation, one would think that the United States would have less food insecurity for its children than other nations. Unfortunately, that is not true. There are 24 nations on this list that have a smaller percentage of food insecure children than the United States (and only 5 nations with a higher percentage). How can this be justified? I don't think it can be justified. The United States has the money to do a lot better than it does. It just doesn't have the moral and political will to do so. It is just a sad fact that our political leaders think it is more important to give tax cuts to rich people and corporations (the people that don't need help) than to feed poor children. Donald Trump has still not won over the public. 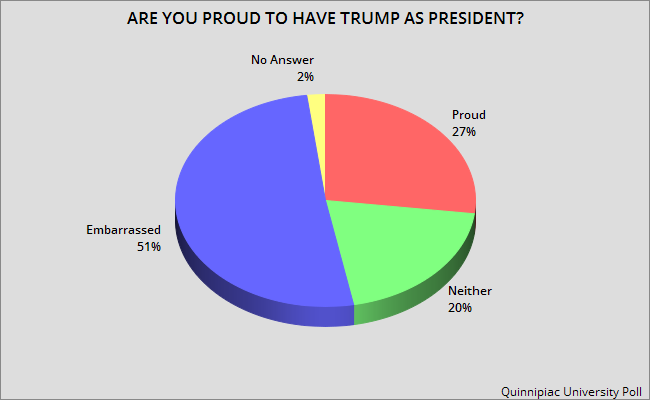 In fact, about 51% say they are embarrassed to have him as president (and only 27% say they are proud). And only 36% approve of how he's doing his job, while 57% disapprove. He remains a very unpopular president, and most Americans don't respect (or trust) his administration. 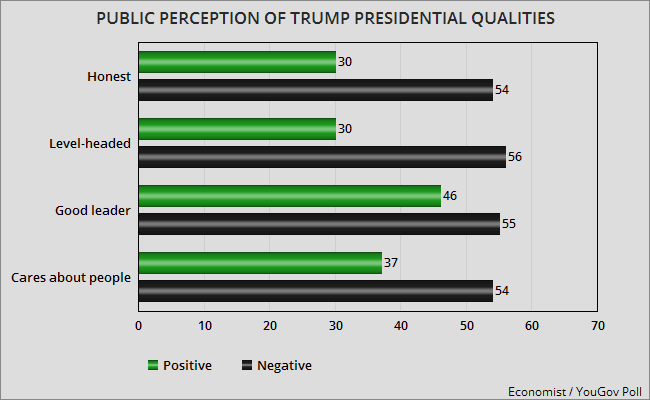 The charts below show why this negative opinion of him persists. 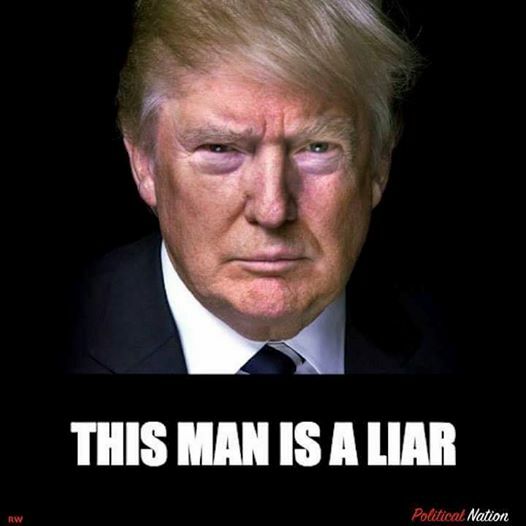 Majorities in two new polls still say Trump is not honest, not level-headed, not a good leader, and doesn't care about average people in this country. Trump is going to remain in negative numbers until he changes those four perceptions. Unfortunately for him, his actions (and Twitter rants) just reinforce those perceptions. 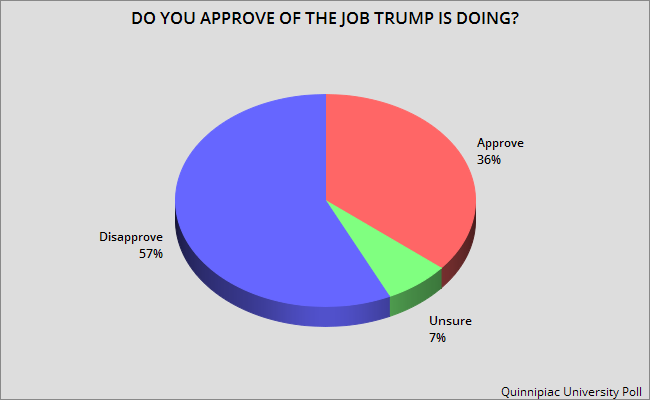 The Quinnipiac University Poll was done between September 21st and 26th of a random national sample of 1,412 voters, with a 3.1 point margin of error. The Economist / YouGov Poll was done between September 24th and 26th of a random national sample of 1,500 adults (including 1,254 registered voters), with a 3 point margin of error. 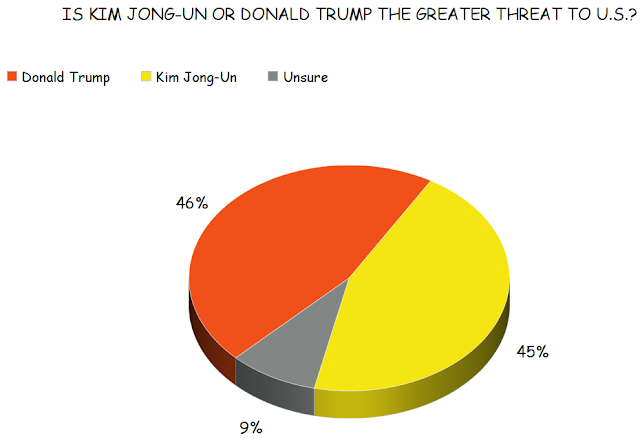 These charts were made using information in the latest Economist / YouGov Poll -- done between September 24th and 26th of a random national sample of 1,500 adults (including 1,254 registered voters), with a margin of error of 3 points. 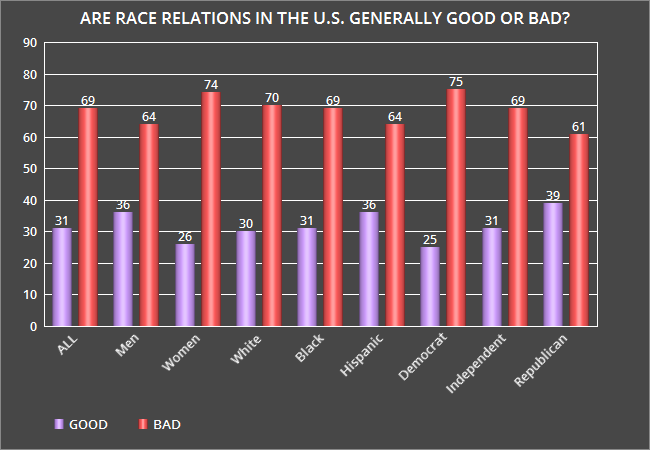 The good thing is that a huge majority of Americans recognize that race relations are not good right now in this country (by a 38 point margin) -- and they see racism as a big problem for the country (by a whopping 60 point margin). That poses the question -- why don't we do something to solve that problem? Why aren't people of both genders, all colors, and all political persuasions demonstrating for something to be done? Why aren't they demanding that the government insure equal treatment is assured for minorities in our institutions (police, courts, schools, workplaces, etc.). Why don't Americans follow their beliefs up with actions? The sad fact is that recognizing a problem doesn't mean you want the problem solved. 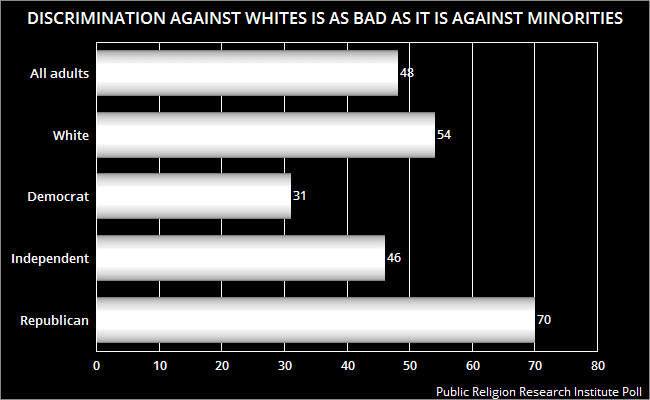 Too many whites, while recognizing the problem, don't want to think about it (or take action to solve it). Too many are racist, or are afraid of losing their white privilege (and having to compete on an even basis with others). 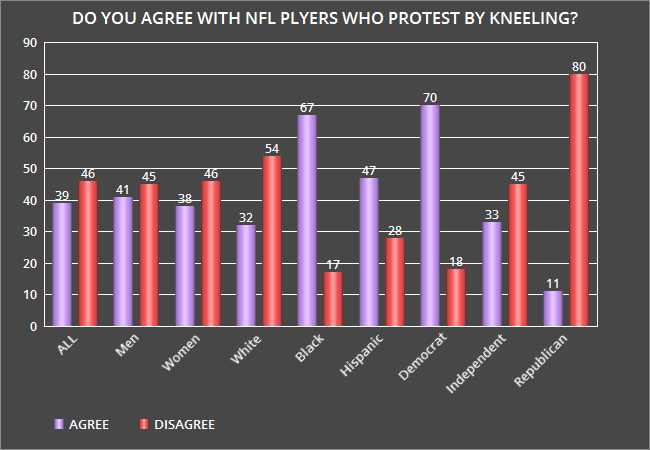 Note in the bottom chart above, about 54% of whites oppose the non-violent demonstrations by NFL players, while only 32% support them. Those are shameful percentages. It makes me think that any kind of demonstrations for equal justice by minorities would be opposed by many whites -- and that's a big reason why racism continues to be a problem in this country. 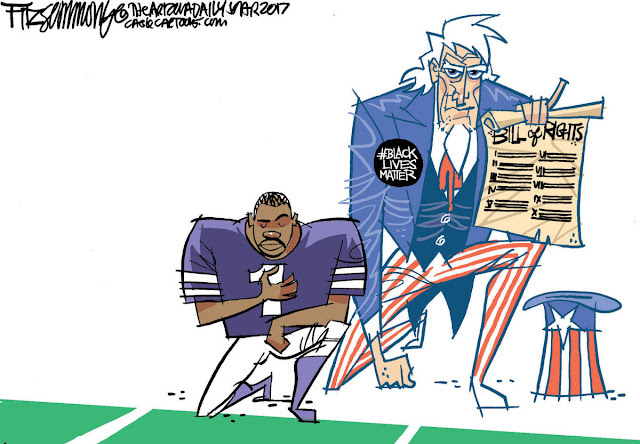 If you don’t like how Black Lives Matter pursues its agenda, you should welcome the NFL players’ approach. 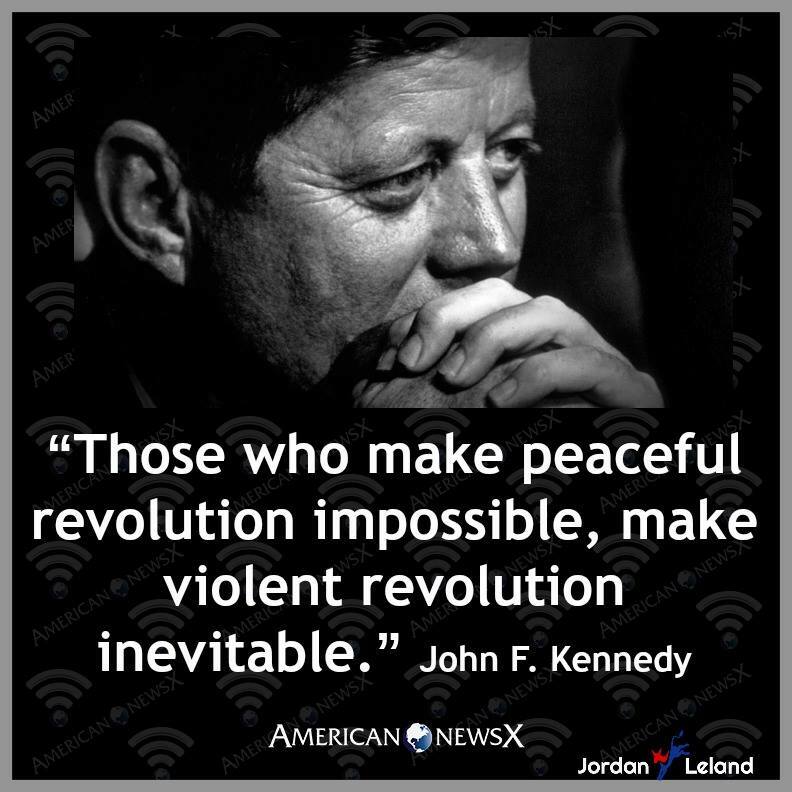 It’s silent; it’s not disruptive; and it’s entirely nonviolent. It doesn’t block traffic, occupy police or frighten bystanders. Critics say it’s disrespectful to the flag, but no flags are harmed — and it could be taken as a form of respect for the flag to mutely signal your belief that the ideals it represents are not being realized. That the display evokes so much fury and disgust among whites, from the president on down, confirms what was evident 50 years ago. The problem is not how blacks raise their complaints about American society; it’s that they raise them. . . .
Every time unrest erupts in black communities in response to some perceived injustice, finger-wagging whites wonder why blacks can’t express their dissent in an orderly, law-abiding way. But every time African-Americans protest peacefully, the same whites object to the message, the tactics, the purpose or the slogans. Unsympathetic whites often ask why blacks are so unwilling to acknowledge progress, to express gratitude for living in a free country and to focus on the problems in their own communities. But unsympathetic whites asked the same questions back in the 1960s. Many whites have always been in a hurry for African-Americans to stop griping about discrimination and get over it. Detractors demand to know how such highly paid athletes have the nerve to question a country that has rewarded them so richly. They could ask the same question about Donald Trump — who owes his wealth to a nation that his inaugural address depicted in nightmarish terms. Trump can insulate himself from the dangers he sees. But these players are as much at risk from bad cops as other black men. A GenForward poll last year found that only 26 percent of young adult African-Americans trust police to do the right thing, compared with 73 percent of their white peers. 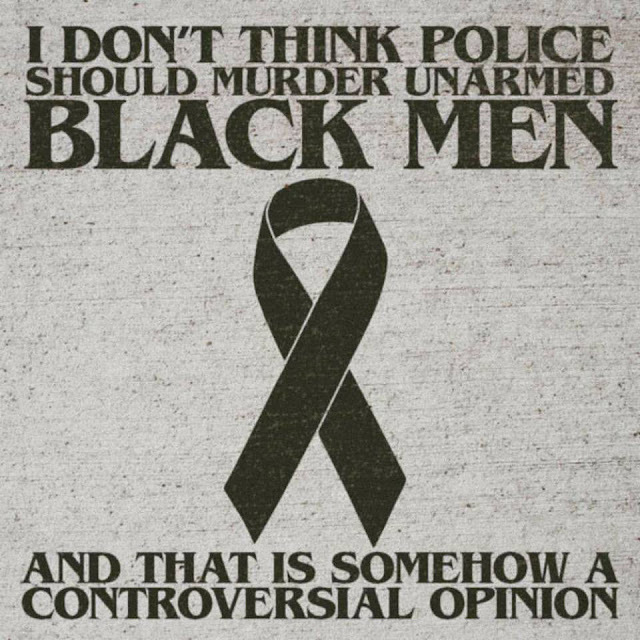 Small wonder that Colin Kaepernick and other black athletes want to draw attention to what they regard as a mortal danger. 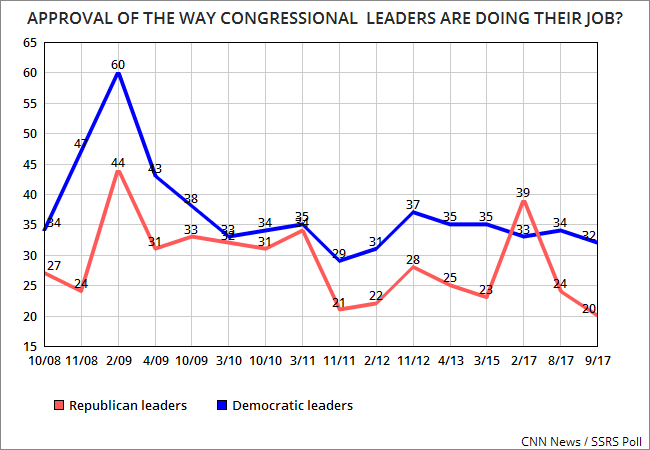 This chart shows the historical results of the CNN Poll on how the public approves of how the party leaders in congress do their job. The latest CNN News / SSRS Poll was done between September 17th and 20th of a random national sample of 1,053 adults, with a 3.7 point margin of error. Note that approval of Republican leaders has reached a record low for this survey. 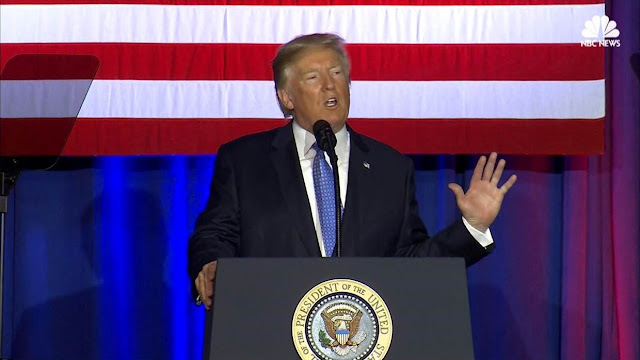 There are a couple of things you need to know about the Trump/Republican tax cut plan just revealed (in a 9 page broad outline). 1. While Americans were told the tax plan was aimed at helping the middle class, the truth is that most of the cuts (the biggest cuts) would go to businesses and giant corporations. The current top rate of 39.6% would be massively cut to 20% for corporations and 25% for other businesses. Americans would see their standard deduction doubled to $12,000 for a single person and $24,000 for a married , but it is unclear just how much this would save since other deductions (unnamed) would go away. The number of tax brackets would be reduced to three, and that was also unclear just how that would affect taxpayers. The only clear thing is that this bill is a massive tax giveaway to corporate America. 2. 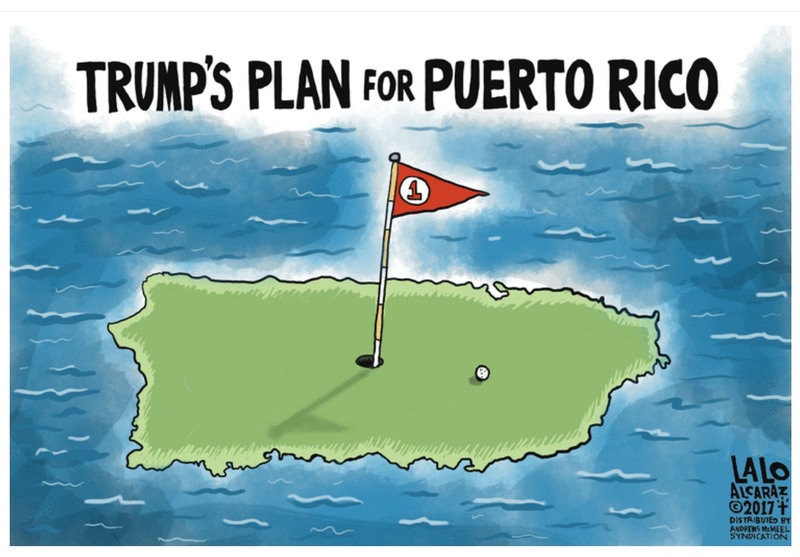 Trump has already told at least two lies about the plan. First, he said the plan would not benefit him. 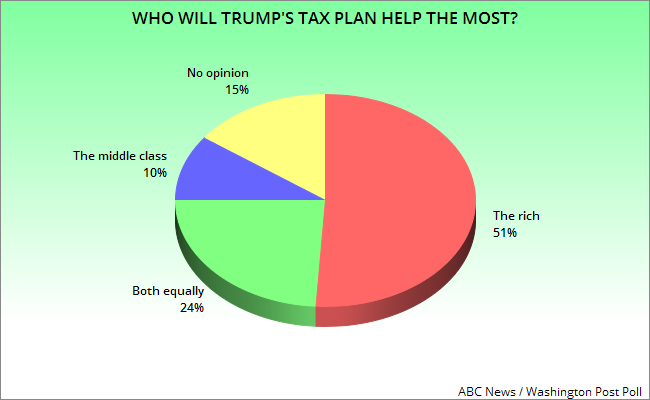 But it would benefit him in several ways -- elimination of inheritance taxes (which only apply to the rich), elimination of the alternative minimum tax, the cuts to businesses (which will save his own businesses millions of dollars. Second, he said that cutting business taxes would result in more jobs. That is just silly. If any business person already has enough employees to adequately service their customers (and only a poor businessman would have more or less than necessary), then why would they hire new workers with the extra tax money they get to keep. They wouldn't, because that would just unnecessarily cut into their own profits. What other lies are Trump and the Republicans telling us about their tax cut plan? The picture above, from the Associated Press, was found at the ABC News website. It shows the Dallas Cowboys players, coaches, and owner kneeling arm-in-arm before the football game last Monday night. They said it was to show their support for equal rights (and their fellow NFL players). They were booed by a significant portion of the crowd there to see the game. My question is -- why were they booed? 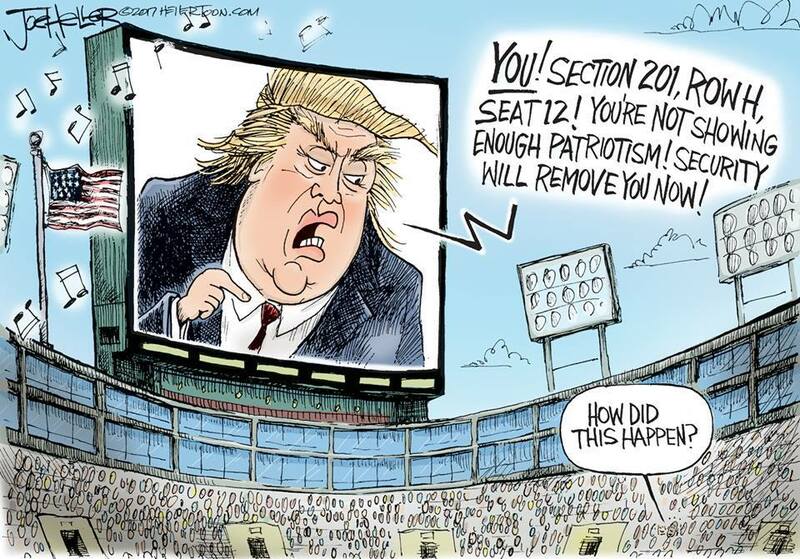 It cannot be because they "disrespected" the flag or the anthem. The kneeling was done BEFORE the flag was unfurled and the anthem sung. They stood (arm-in-arm) during the singing of the anthem. All I can figure is that those who booed don't respect the First Amendment to the Constitution (which guarantees the right to peaceably demonstrate), or the Fourteenth Amendment to the Constitution (which guarantees equal rights under the law to all citizens), and don't believe the police should be required to treat minorities the same way they treat whites (which is what the kneeling is about). That's a sad commentary on our society -- that many people would put a piece of cloth and a song above the rights guaranteed by the Constitution. 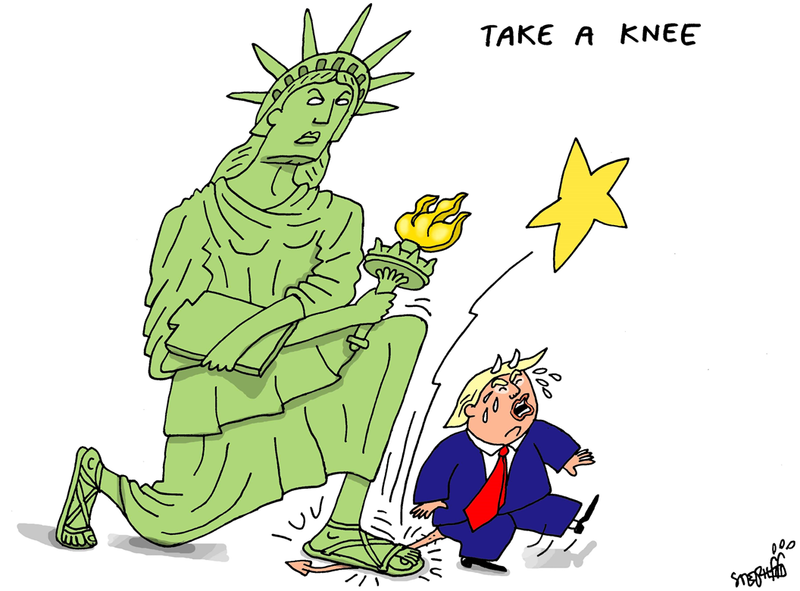 Why don't they realize that those rights are far more important to our democracy than showing respect to symbols (a flag or a national anthem)? Fortunately, a new poll shows that although those people disrespecting our Constitution are a minority (albeit a significantly large minority). 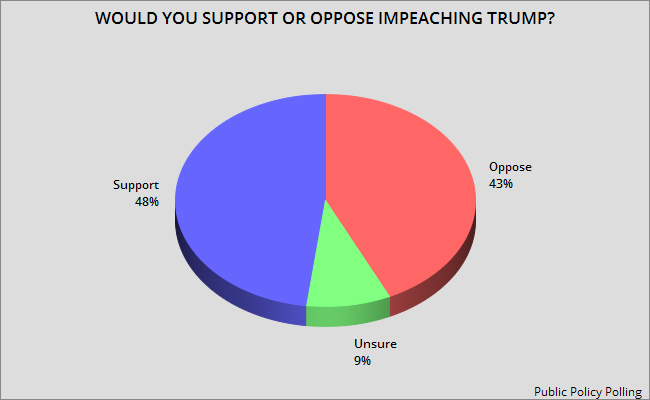 The survey is the Reuters / Ipsos Poll -- done on September 25th and 26th of a random national sample of 1,622 adults, with a 2.8 point margin of error. 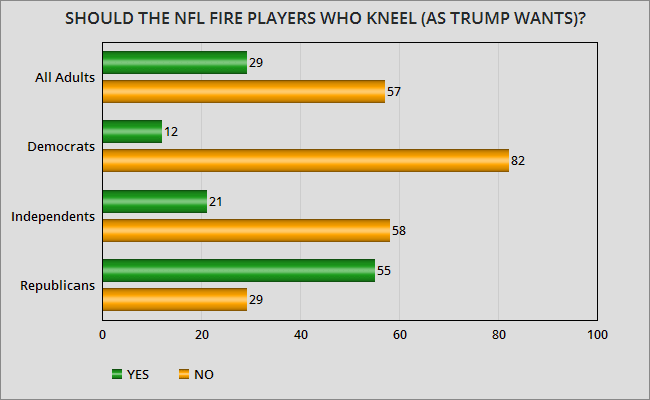 It shows that 57% of the public disagrees with Trump that NFL players who kneel should be fired, while only 29% agree with Trump. 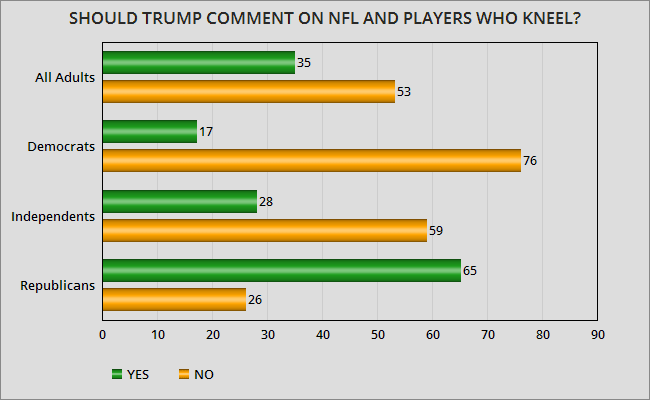 In fact, 53% don't think Trump should be commenting on the players kneeling anyway, while only 35% think he should be commenting. So far, Donald Trump's presidency has been an abject failure. 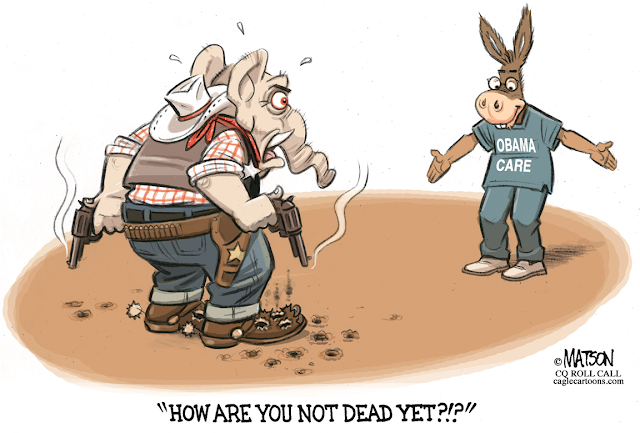 He has gotten nothing done legislatively, and most of his statements have just served to further divide the country. My family immigrated to the United States of America on the third boat after the Mayflower. Our heritage precedes any records of Trumps, or Drumpfs, in America. Members of my family have served in every major conflict in US history with the exception of Iraq; your family cannot say the same. Yet, you continue to act as if you’ve sacrificed for the betterment of our country when the reality is: we don’t even know you’ve paid taxes half the time. Instead of acknowledging your past though, and honorably promising to change from a position of great entitlement, you accost service members you don’t care for, threaten democracy with attacks on the media, and worsen divides that threaten to tear America apart. Moreover, there’s a part of me that’s angry from a personal standpoint, my father founded the criminal divison of the EPA, and was the senior environmental prosecutor in the country until 2014, and whose storied career began with work on Watergate. You’ve destroyed his life’s work in under 7 months, but I’m not writing this from a position of anger or even from a personal standpoint, I’m trying to speak for a great many Americans who are understandably frightened for the future; who feel they’re watching the degradation of our way of life. This letter isn’t about me, or my feelings, but it is intended for you, Mr. President. There’s a storm coming and as our enemies around the world lick their chops watching the division within America, we continue to charge towards a future in which we tear ourselves apart. Many of us, yourself included, seem to have forgotten what it means to be American. If our memory continues to fail and we forget entirely what being American truly means, we’ll not only lose our status as the world’s leader, we won’t deserve it anymore. This is not a world I can imagine nor that I have any desire to. Without America to serve as an eternal source of light within the darkness the world will be cast into chaos. In order to preserve what so many gave so much to obtain, we must first remember what it means to be American. While we seem hopelessly intertwined in a national, and very partisan, identity crisis we can only hope to pull out of it by remembering the lessons our founding father’s taught us all those years ago when they first defined, through their actions, what it means to be American. Currently, there are a few misconceptions on what makes someone American; there seems to be a great deal of entitlement when considering the term. I was born a white male and a citizen of The United States of America but I don’t think that makes me an American. There seems to be a lot of controversy swirling around this notion but the reality is being born a certain way entitles me to nothing. The circumstances of birth don’t make you American, they never have, but actions do. We earn our status as American through our actions day to day, month to month, and year to year. In doing the right thing by our loved ones, our countrymen, and ourselves we become American. There’s not flashy gesture or fancy piece of paper that can make you truly American but living the right way can; waking up and doing the right thing everyday, no matter how big or small the action, is what makes us American. It isn’t a static definition either, it’s a dynamic one just like we are as people; always changing, growing, and working towards the betterment of not only ourselves but our society as a whole. When considering how we define being American it’s worth noting those criteria. When I voted it was in a densely populated, urban sector of Philadelphia. There were four booths for hundreds of people; many of whom were elderly and couldn’t stand for hours. It was a very telling few hours. Some of those elderly individuals struggling the most sported Make America Great Again hats. Instead of being happy at your supporter’s misfortune though I spent my day making trips to a conference room located at the back of the line hundreds of people long in order to ferry chairs to those who couldn’t stand. It wasn’t a big gesture or one that required a tremendous effort, it certainly DID NOT deserve any praise, because I knew it was merely the right thing to do for my fellow American. This attitude seems to be dying though, as we forget more and more what being American means. As I walked back and forth with chairs under each arm I watched many of my young peers barely look up from their phones; some even seemed noticeably annoyed that a fellow millennial would go out of his way to help your supporters. Make no mistake, those watching seemed to have forgotten what being American means just as much as anyone. When nobody joined in to help I was only made more aware of the change I’ve seen in my lifetime; the gradual shift many of us have noticed in our culture. It might seem subtle to some, but many have forgotten to do the right thing for no other reason than it helps another American. If this lack of support for each other continues to proliferate we’ll witness the decay of American values and worth This is something I attribute to the win at all cost/look out for yourself mentality that’s taken over politics and permeated into our culture; winning has become more important than standing up for each other. Americans used to do the right thing automatically, while many still do, others have stopped if there’s no reward or personal incentive. Americans used to help each other no matter who was President and that’s truly what made America great; our uniquely American loyalty. That loyalty, love, and solidarity saved us from the greatest threat the world has ever known, liberated Europe, and won two world wars. There’s been a change though. It’s apparent everywhere. We saw it when 23 of 24 Texas congressmen voted to deny aid when Hurricane Sandy hit, now faced with Harvey, Texans find themselves in an unfortunate position. This is merely one example of a larger problem within our society though and if this cancerous divisionist mentality continues to spread we’ll witness our downfall. Hope is not lost though because it isn’t too late to start putting America, and each other, first again; all that’s required is remembering what made us Americans in the first place. In school, when I was young and studying our history, I learned a great lesson; one I think is important enough to share. I learned that being an American isn’t something you obtain from being born here, or even from keeping other people out; being American is something you become through your actions and character. Defining what it meant to be an American was something our founding father’s sacrificed all that they had for. Today, with all the modern luxuries we have it’s hard to understand being so passionate about something you’d die for it but our founders had that passion for the characteristics which would later define our nation. By fighting so fervently amongst ourselves that we forget the value of other Americans we put into jeopardy all that we have. It’s all of our duty to honor that which our founding father’s felt defined America. Honoring those traditions can mean different things to different people but all of us must find a way to honor them, every day if we are ever to truly Make America Great Again. This isn’t hard to do, it only takes remembering to do the right thing. I’m not perfect, in fact, I would consider myself the last person for anyone to take their cues from, but for me, I honor those traditions by trying to do the right thing every day to the best of my ability, whether it’s big or small, seen or unseen, noted or unnoticed. You see, if you remember to do the right thing, to treat others how you’d like to be treated, and do everything to the best of your ability, I promise everything else, all the nonsense in the media, won’t matter a single bit, because we’ll once again have a country of people who look out for one another. The alternative is unacceptable. Tell the truth. In times of doubt, the truth is always the right answer. 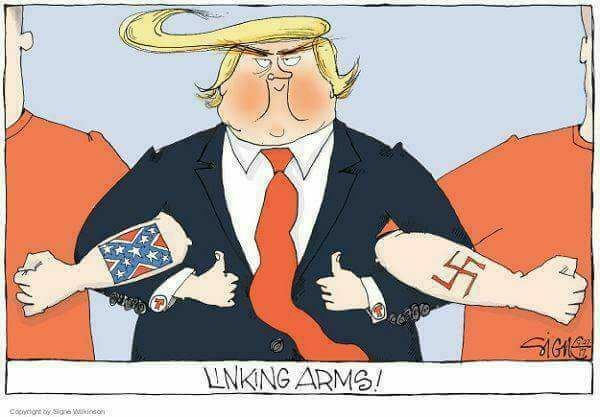 If lies are allowed to be believed as fact America will continue to forget that the real enemy isn’t each other, it’s those who seek to end democracy, freedom, and our way of life. Stop defining what it means to be American from a partisan stance. You have no right. None of us do. Being American is defined by those who came before, and it’s defined by those whose examples will survive the test of time. If someone is willing to come here, work hard, abide by our laws, and protect our way of life, then you, Donald Trump, have no right to tell them they cannot be Americans. Being born to millions in New York, dodging your country’s call in its time of need, and verbally accosting service members does not make you the one to decide what it means to be an American. Stop attacking the media. You bear a great responsibility; millions of Americans look to you for guidance and comfort during hardship. If you continue to point their anger at the media we may lose an integral pillar of democracy. If you do not you will cement your legacy as the enemy of democracy. History will condemn you. Stop using radical Islam and immigrants as scapegoats to bring people together. We’ve seen in history scapegoats unite the masses but at great cost. Instead of pandering to the fears of your base you could teach them to accept. You’ve uniquely been able to reach the individuals that make up your base unlike any before you; you have the opportunity to take advantage of their love for you and to teach them that being American really means doing the right thing above all else. In doing this you could not only save your legacy but America as a whole. There is a storm coming and it cannot be defeated by a divided nation; a storm that doesn’t care if you’re liberal or conservative, a storm that seeks to upend democracy, freedom, and our way of life. 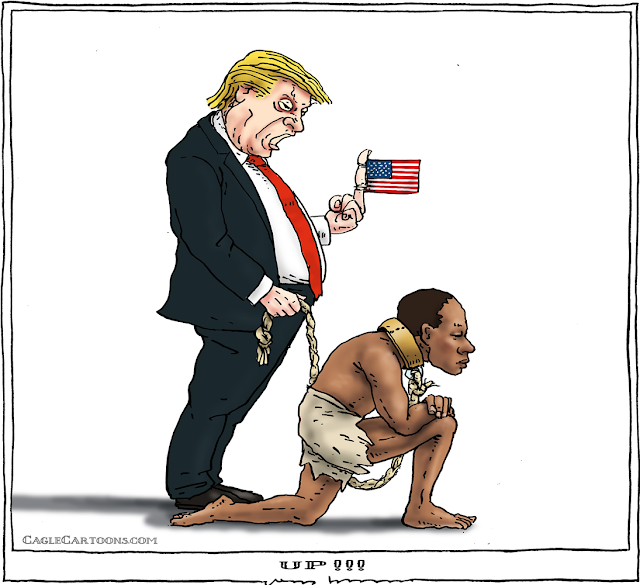 As Americans, we have to do the right thing even when it isn’t easy, even when there’s no reward because that’s truly what makes us Americans and if we forget that, we’ll truly be lost. 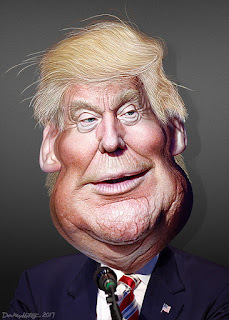 Donald Trump, and his congressional Republican cohorts, think giant corporations are taxed to heavily (in spite of the fact that about a third pay no taxes and the rest pay far less than the top tax rate of 39.6%). 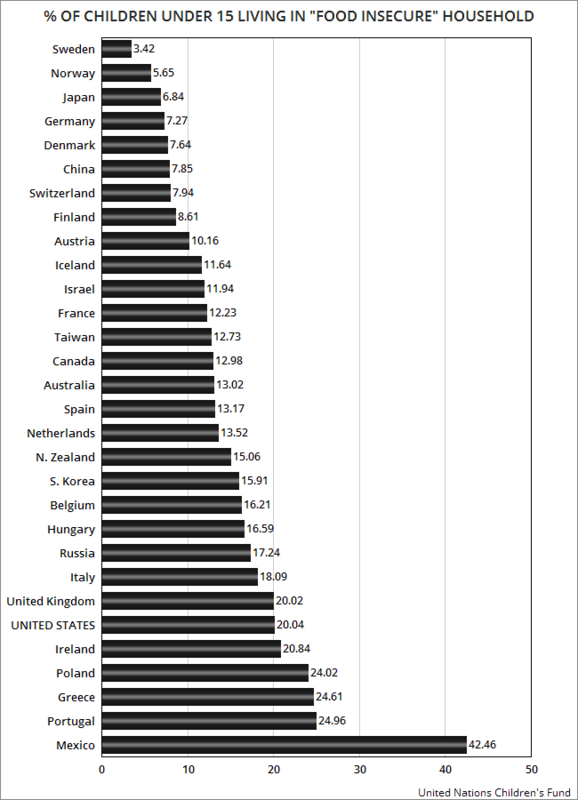 They lie in saying American corporations pay more than corporations in any of the other developed nations. And they hope you'll believe that lie so they can give those corporations a huge tax cut. Trump wants to cut the corporate tax rate to only 15%, and congressional Republicans want to cut it to 20%. They would have corporations paying a smaller tax rate than many middle class Americans. The excuse they use is that cutting the tax rate will create jobs. That's a lie. Only one thing creates new jobs -- a rise in the demand for goods/services. Job creation has nothing to do with the tax rate. 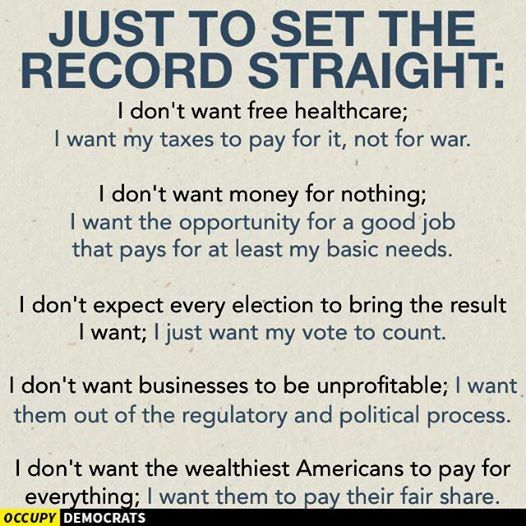 They will also tell you that if the rate is cut, then corporations will bring the trillions they are hiding overseas back to this country and use it to create jobs. That's another lie. Those corporations could bring money back right now to create new jobs and pay no tax on it -- because employee salaries are a business deduction subtracted from profits before taxes are figured. Fortunately, it looks like the public is not buying their lies. 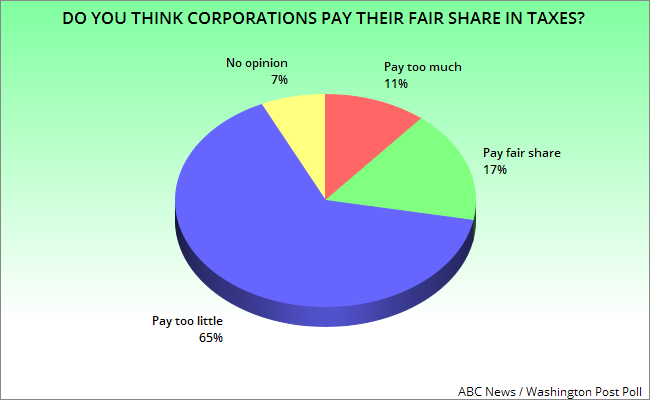 About 65% of the public says corporations pay too little in taxes, while only a minuscule 11% say they pay too much. 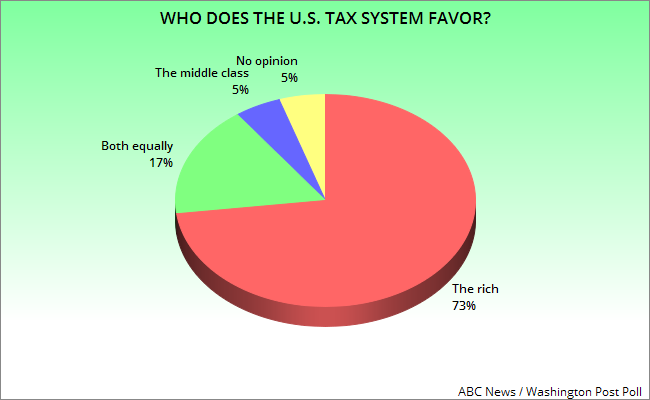 The public thinks the tax system is unfair, but not to the wealthy or corporations. 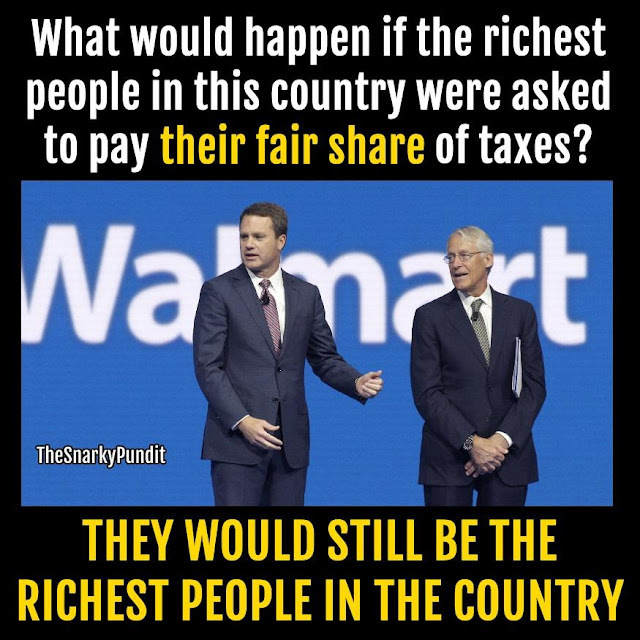 They think the tax system favors the rich and corporations over the middle class. And they also think the plan put forward by Trump would do the same thing -- give the wealthy and the rich a big cut, but not the middle class. 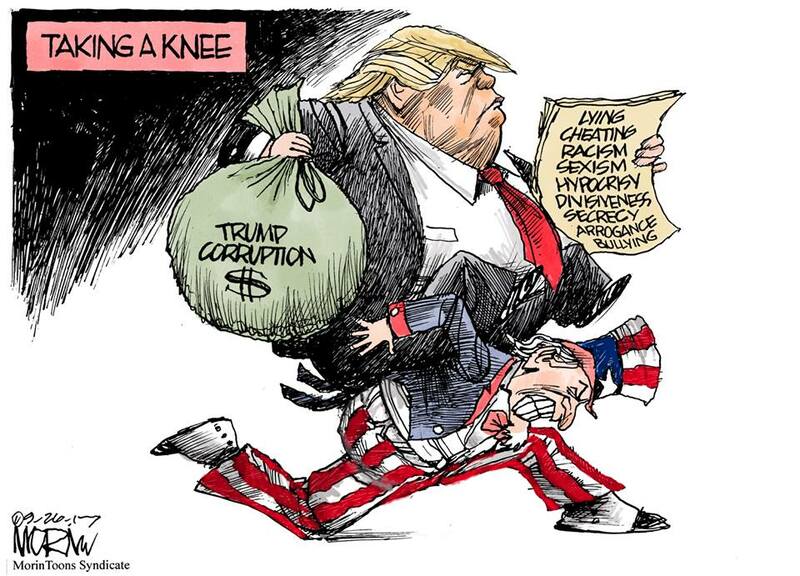 It looks like Trump and the Republicans have a lot of convincing to do before they can pass their tax giveaway to the corporations and the rich. These charts reflect the results of a new ABC News / Washington Post Poll -- done between September 18th and 21st of a random national sample of 1,002 adults, with a 3.5 point margin of error. 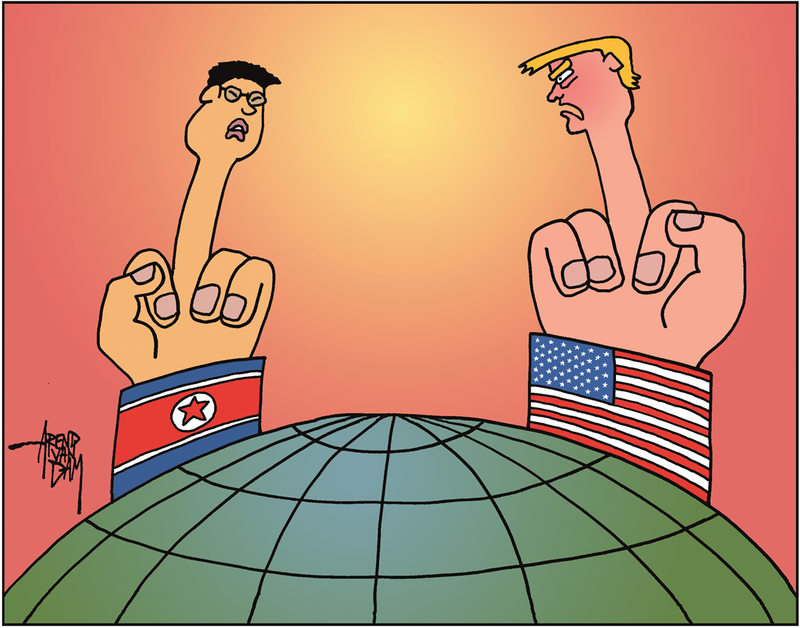 Political Cartoon is by Joe Bertrams at cagle.com. Donald Trump likes to portray himself as the savior of the United States -- the person who will "Make America Great Again". But that's just his narcissism talking. 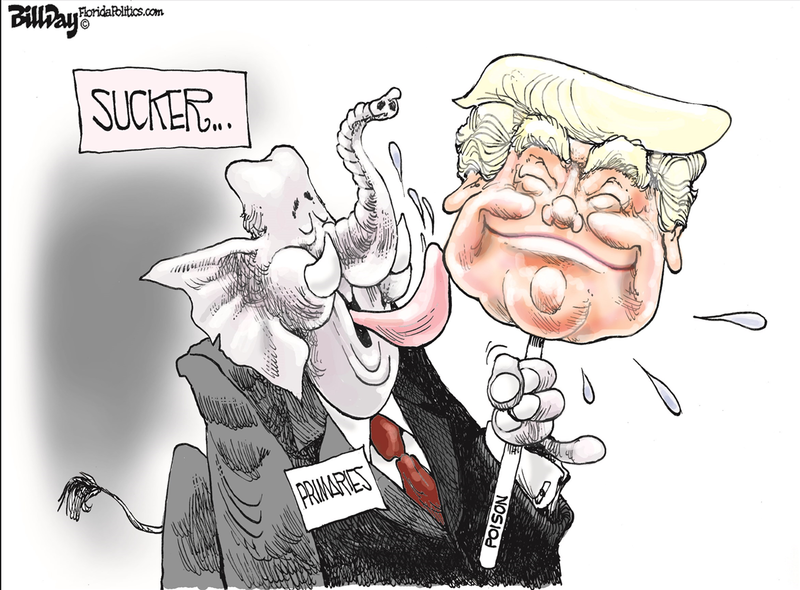 The public sees him far differently. In fact, about 46% of Americans see Donald Trump as a greater threat to the United States than North Korea's Kim Jong-Un (45%). 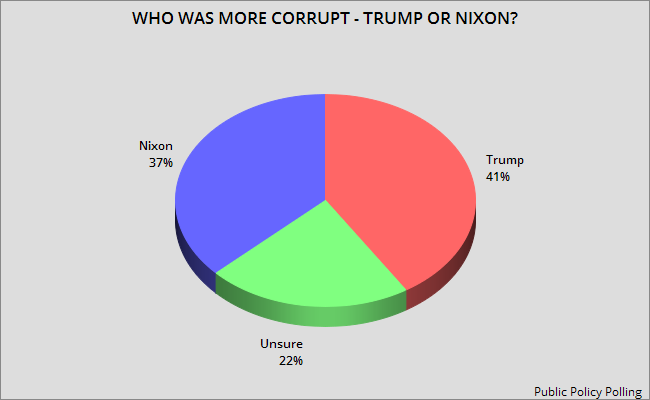 The chart reflects the results of a recent Rasmussen Poll -- done on September 24th and 25th of a random national sample of 1,000 likely voters, with a 3 point margin of error. The United States took a big step in the 1960's toward solving the serious racial problems in the United States -- by passing a trilogy of Civil Rights laws. Some people thought that was all that needed to be done. They were wrong. Our social institutions (police, schools, courts, workplaces, etc.) continued their practice of discrimination against minorities. Decent people knew that more needed to be done. 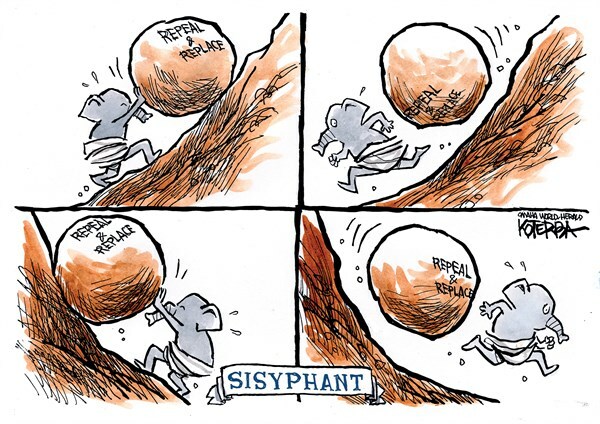 But the election of a Black president seemed to make the problems worse instead of better, because it brought the unrepentant racists back out from under their rocks. And the election of a racist president to follow them emboldened them further. Now we not only have the problem of institutional racism, but also a vocal base of racists who want to take the country back to a dark time of bitter inequality. 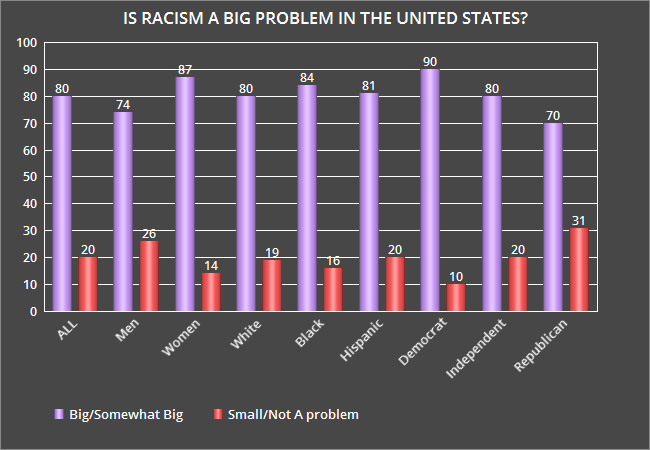 Why can;'t we solve the racial problem of discrimination and inequality in this country? The charts above tell us a lot to answer that question. Note that nearly half of all whites (49%) and about 66% of all Republicans actually believe the police treat minorities as well as they treat whites. 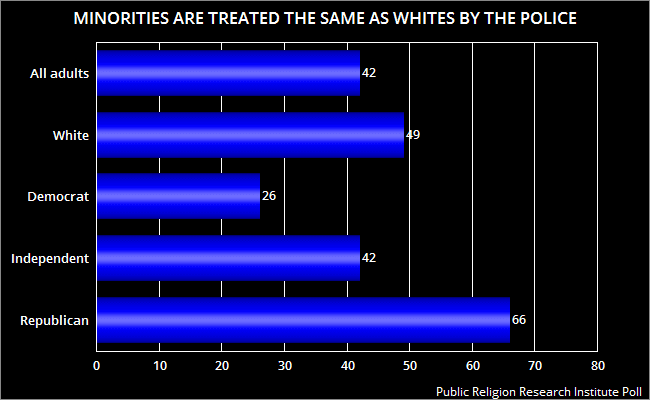 And 54% of whites (and 70% of Republicans) think whites are discriminated against as much as minorities are. Those are shocking numbers. How can such large percentages of whites and Republicans believe that? 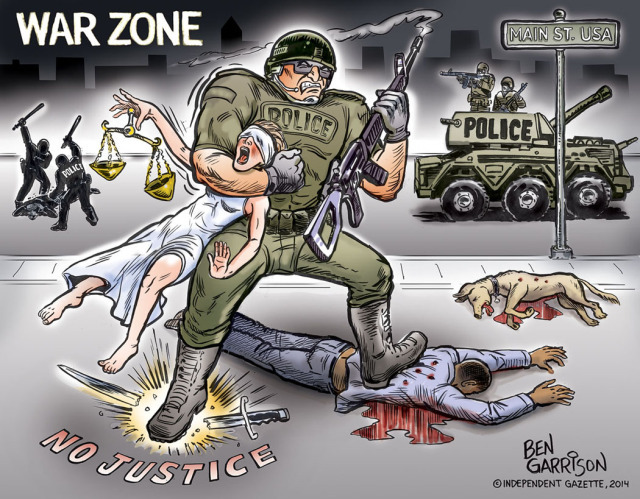 They must be willfully blind to believe the police treat whites and minorities equally. And the idea that giving minorities equal rights is somehow discriminating against whites is ludicrous. Equal rights is not a pie, and giving rights to one groups does not take them away from any other group. But I think these people know that. They just don't want to give up the advantage they have always enjoyed over minorities (i.e., white privilege) in this country. We must have an honest and in-depth discussion of race and how to solve the nation's racial problems, and it is especially incumbent on whites to be honest in that discussion (examining and understanding the privilege they have always enjoyed at the expense of minorities). This could be a great nation that lived up to its potential and ideals -- but that will not happen until we honestly address the racism in the country. The charts above reflect the results of a Public Religion Research Institute Poll -- done between April 11th and May 12th of this year of a random national sample of 3,455 adults, with a 2.5 point margin of error. 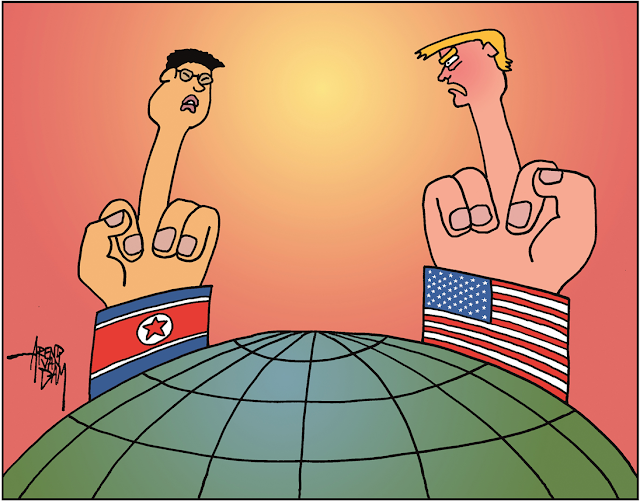 Political Cartoon is by Stephane Peray at cagle.com.